It seems like everywhere you go in the world of nanotechnology Northwestern University is talked about. The only nano-specific degree they give is a Masters of Science. Where Northwestern really shines is in its resources for students: the International Institute for Nanotechnology and three important nano centers. The International Institute for Nanotechnology started in 2000 and coordinates more than $500 million in nano research funding and infrastructure. IIN has partnerships in 18 countries outside the United States, as well as connections with universities worldwide. For students, these relationships mean they can take advantage of postdoctoral exchange programs. Their annual symposium draws researchers from around the world. IIN has helped to launch 16 startup companies through their Small Business Evaluation and Entrepreneur program (SBEE). Their Nanotechnology Corporate Partners program consists of 20 member companies. Detection techniques for Alzheimer’s and prostate cancer, for example, have been advanced by the work of NSEC. The Center allows undergraduate and graduate students to take advantage of their research facilities. The Center also promotes education in nanotechnology through several interesting programs for teachers and precollege classrooms. 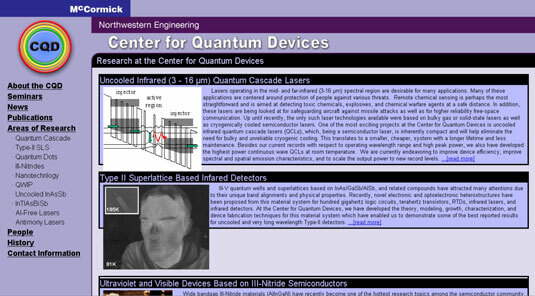 Northwestern University Center of Cancer Nanotechnology Excellence is a wonderful resource for students interested in nanomedicine, specifically detection and treatment of cancer. This center is funded by the National Cancer Institute and works closely with the International Institute of Nanotechnology. CCNE offers several valuable research facilities on Northwestern’s campus. The Center for Quantum Devices was founded in 1991 with a focus on semiconductor research that involves nanotechnology. The Center works with the help of approximately 15 undergraduate and graduate students, as well as offering mentored research time to undergraduates at Northwestern. Their website offers some interesting information and images of nanotechnology.